Toltec Jewels is hosting a blog hop today, featuring Chicklet Beads from Susan Kennedy of SueBeads. I have designed with Sue’s Chicklet beads before and I really love them, so I was excited to have the opportunity to use these beads again. 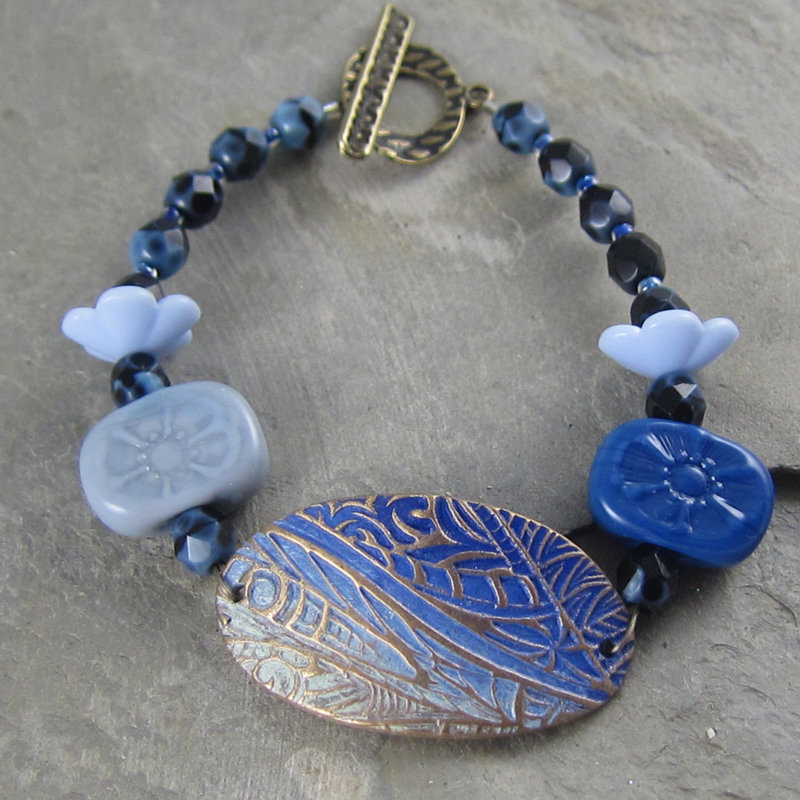 Here’s a bracelet I designed with Sue’s Chicklet beads, in May 2014. 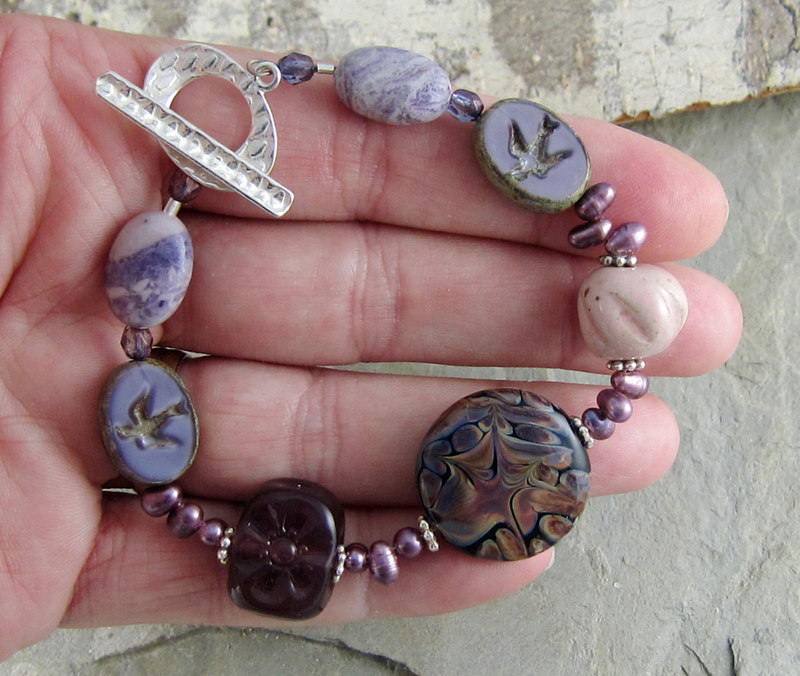 For today’s blog hop, I received a plum purple colored Chicklet bead. 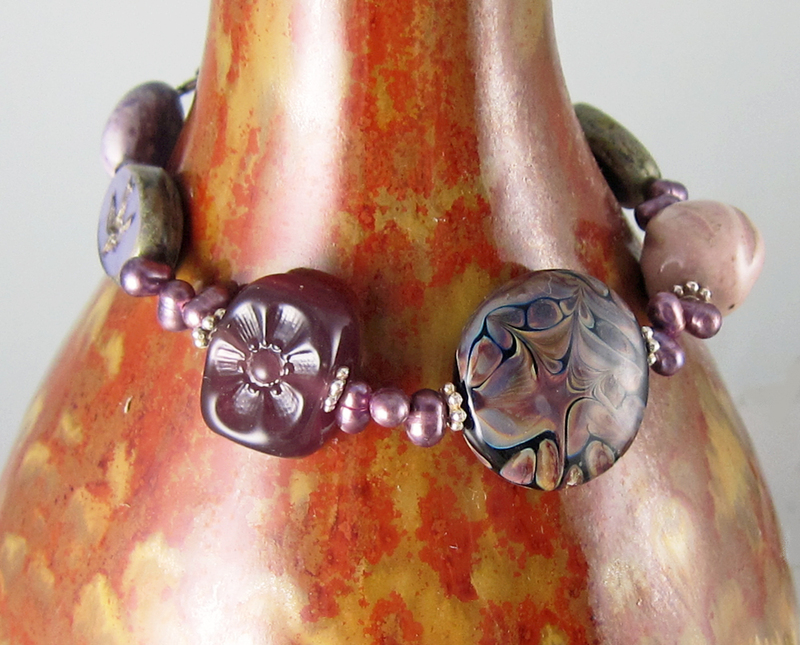 I like the way these tab beads lay flat in a bracelet design, so I combined my Chicklet bead with other artisan beads and came up with this “Plum Delight” bracelet. I combined Sue’s Chicklet bead, with a lentil shaped bead from Beads & Botanicals and a ceramic bead from White Clover Kiln. Additional accents include tip-drilled pearls, purple Czech glass bird beads, fire polish beads and ovals of Chinese Charoite. Thank you Toltec Jewels for hosting this wonderful blog hop! And thank you Sue Beads for your lovely lampwork beads! 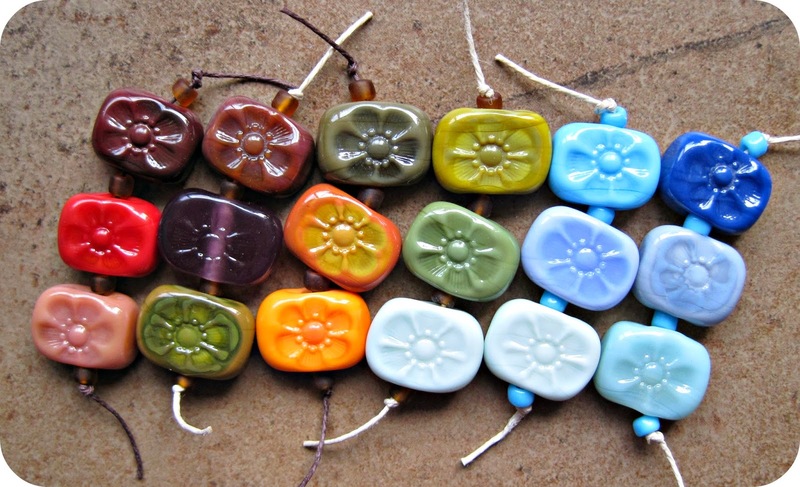 Now check out all the other jewelry designers who created awesome designs with Sue’s Chicklet Beads! This entry was posted in Art Beads and Components, Bead And Jewelry Challenges, Jewelry and tagged Art Beads, artisan jewelry, bead blog, Beads and Botanicals, blog hop, bracelet, Chicklet Beads, handmade jewelry, Linda Landig Jewelry, Sue Beads, Toltec Jewels, White Clover Kiln by Linda Landig. Bookmark the permalink. Absolutely lovely bracelet Linda! The colours are beautiful! Your bracelet is gorgeous! I love purple and love the way you brought all these fabulous shades of it together! Your bracelet is beautiful! I love Sue’s chicklet beads. Gorgeous selection of beads and colors. Well done! What a great combination of yummy colors! I really love how you used those tiny pearls, too! What a beautiful bracelet! the colors are just so yummy! and love the other one from May! Sue’s beads are just so much fun to play with!! 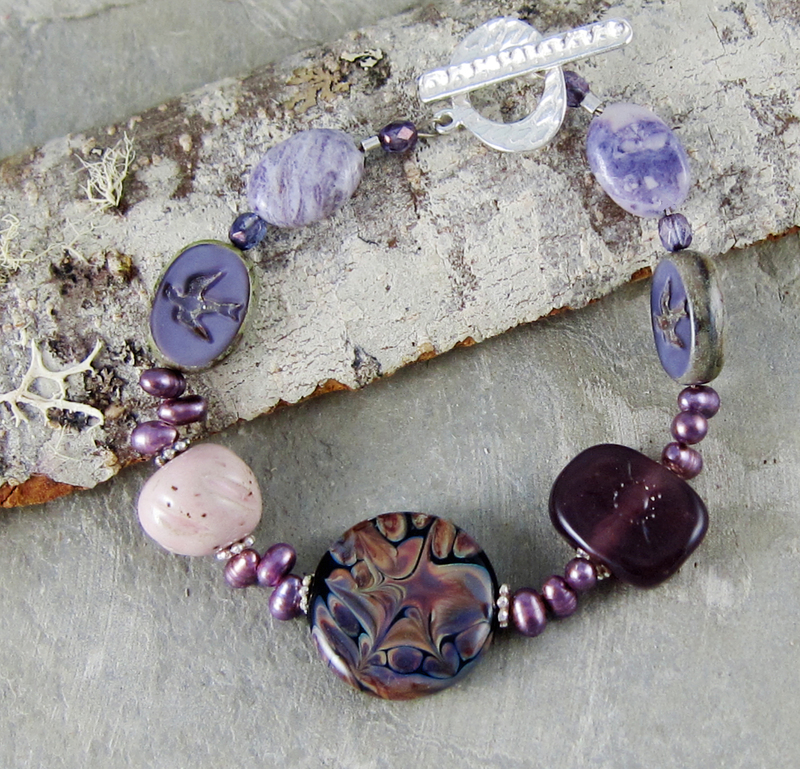 Your Plum Delight bracelet is gorgeous! Beautiful! I just love the way the glass goes with all the other pearls and ceramic beads. Both bracelets are stunning. I love the diversity of beads you chose for your plum chicklet in this challenge. It’s fabulous. I like them both. 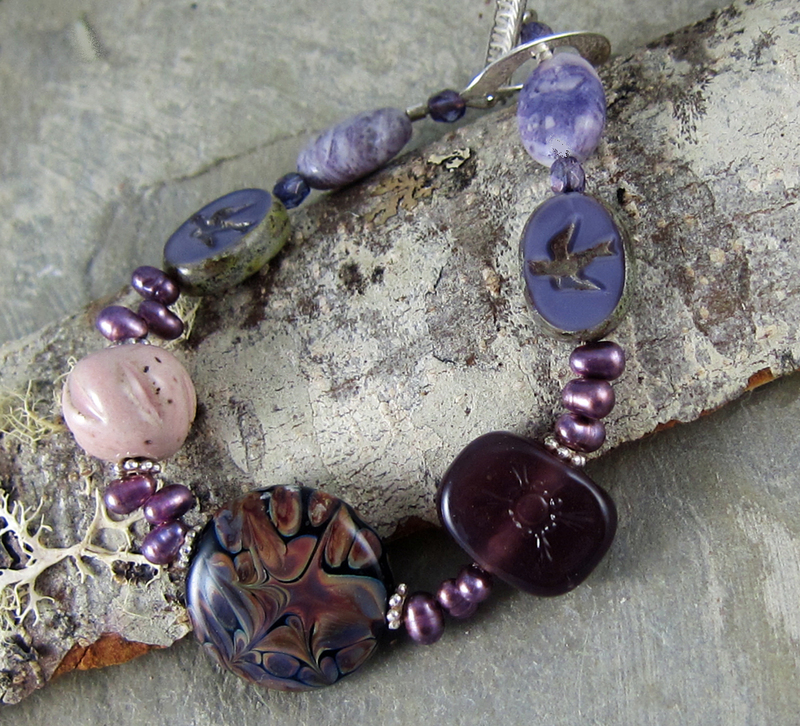 I am partial to purple so the plum bracelet is really appealing and has a nice balance of interesting beads. What a great bracelet! I bet that it is really comfortable to wear also with all the flat beads. Both are the lovely. The plum is perfect. Oh my that is a stunning bracelet, I adore the colors! Woman! Did you hear the thud when I hit the floor? Oh my word! You are like the bead whisperer or something, I swear! Yeah, I rather like what you created…!!!! Wow, those beads together are magic! Gorgeous bracelet. Love the colour and the design. Oh wow. What stunning beads. I love your bracelet, it is so delicate. Love,love, love your plum bracelet. Great use of color and fabulous design. I would wear this in a heartbeat! Being a purple lover, I would say your piece is spot on! I love your choice of beads….Excellent piece and job!